"Vascular" redirects here. For information about plants, see Vascular plant. The inner layer, tunica intima, is the thinnest layer. It is a single layer of flat cells (simple squamous epithelium) glued by a polysaccharide intercellular matrix, surrounded by a thin layer of subendothelial connective tissue interlaced with a number of circularly arranged elastic bands called the internal elastic lamina. A thin membrane of elastic fibers in the tunica intima run parallel to the vessel. The middle layer tunica media is the thickest layer in arteries. It consists of circularly arranged elastic fiber, connective tissue, polysaccharide substances, the second and third layer are separated by another thick elastic band called external elastic lamina. The tunica media may (especially in arteries) be rich in vascular smooth muscle, which controls the caliber of the vessel. Veins don't have the external elastic lamina, but only an internal one. The tunica media is thicker in the arteries rather than the veins. The outer layer is the tunica adventitia and the thickest layer in veins. It is entirely made of connective tissue. It also contains nerves that supply the vessel as well as nutrient capillaries (vasa vasorum) in the larger blood vessels. When blood vessels connect to form a region of diffuse vascular supply it is called an anastomosis. Anastomoses provide critical alternative routes for blood to flow in case of blockages. There is a layer of muscle surrounding the arteries and the veins which help contract and expand the vessels. This creates enough pressure for blood to be pumped around the body. Blood vessels are part of the circulatory system, together with the heart and the blood. The biggest difference in the structure of arteries and veins is the presence of valves. Backflow of blood is prevented in arteries by the heart. However in veins, one-direction valves are used to prevent backflow as a result of a decrease in blood pressure as the blood passes through the circulatory system. Venae cavae (the two largest veins, carry blood into the heart). Extremely small vessels located within bone marrow, the spleen, and the liver. They are roughly grouped as "arterial" and "venous", determined by whether the blood in it is flowing away from (arterial) or toward (venous) the heart. The term "arterial blood" is nevertheless used to indicate blood high in oxygen, although the pulmonary artery carries "venous blood" and blood flowing in the pulmonary vein is rich in oxygen. This is because they are carrying the blood to and from the lungs, respectively, to be oxygenated. Blood vessels function to transport blood. In general, arteries and arterioles transport oxygenated blood from the lungs to the body and its organs, and veins and venules transport deoxygenated blood from the body to the lungs. Blood vessels also circulate blood throughout the circulatory system Oxygen (bound to hemoglobin in red blood cells) is the most critical nutrient carried by the blood. In all arteries apart from the pulmonary artery, hemoglobin is highly saturated (95–100%) with oxygen. In all veins apart from the pulmonary vein, the saturation of hemoglobin is about 75%. (The values are reversed in the pulmonary circulation.) In addition to carrying oxygen, blood also carries hormones, waste products and nutrients for cells of the body. Blood vessels do not actively engage in the transport of blood (they have no appreciable peristalsis). Blood is propelled through arteries and arterioles through pressure generated by the heartbeat. Blood vessels also transport red blood cells which contain the oxygen necessary for daily activities. The amount of red blood cells present in your vessels has an effect on your health. Hematocrit tests can be performed to calculate the proportion of red blood cells in your blood. Higher proportions result in conditions such as dehydration or heart disease while lower proportions could lead to anemia and long-term blood loss. Blood vessels also transport red blood cells which contain the oxygen necessary for daily activities. The amount of red blood cells present in your vessels has an effect on your health. Hematocrit tests can be performed to calculate the proportion of red blood cells in your blood. Higher proportions result in conditions such as dehydration or heart disease while lower proportions could lead to anemia and long-term blood loss. Permeability of the endothelium is pivotal in the release of nutrients to the tissue. It is also increased in inflammation in response to histamine, prostaglandins and interleukins, which leads to most of the symptoms of inflammation (swelling, redness, warmth and pain). Arteries—and veins to a degree—can regulate their inner diameter by contraction of the muscular layer. This changes the blood flow to downstream organs, and is determined by the autonomic nervous system. Vasodilation and vasoconstriction are also used antagonistically as methods of thermoregulation. The size of blood vessels is different for each of them. It ranges from a diameter of about 25 millimeters for the aorta to only 8 micrometers in the capillaries. This comes out to about a 3000-fold range.Vasoconstriction is the constriction of blood vessels (narrowing, becoming smaller in cross-sectional area) by contracting the vascular smooth muscle in the vessel walls. It is regulated by vasoconstrictors (agents that cause vasoconstriction). These include paracrine factors (e.g. prostaglandins), a number of hormones (e.g. vasopressin and angiotensin) and neurotransmitters (e.g. epinephrine) from the nervous system. 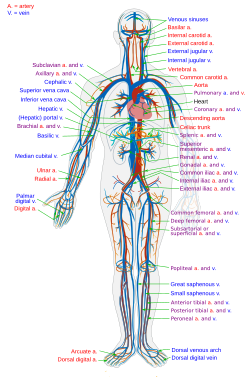 The circulatory system uses the channel of blood vessels to deliver blood to all parts of the body. This is a result of the left and right side of the heart working together to allow blood to flow continuously to the lungs and other parts of the body. Oxygen poor blood enters the right side of the heart through two large veins. Oxygen rich blood from the lungs enters through the pulmonary veins on the left side of the heart into the aorta and then reaches the rest of the body. The capillaries are responsible for allowing the blood to receive oxygen through tiny air sacs in the lungs. This is also the site where carbon dioxide exits the blood. This all occurs in the lungs where blood is oxygenated. Vascular resistance occurs where the vessels away from the heart oppose the flow of blood. Resistance is an accumulation of three different factors: blood viscosity, blood vessel length, and vessel radius. Blood viscosity is the thickness of the blood and its resistance to flow as a result of the different components of the blood. Blood is 92% water by weight and the rest of blood is composed of protein, nutrients, electrolytes, wastes, and dissolved gases. Depending on the health of an individual, the blood viscosity can vary (i.e. anemia causing relatively lower concentrations of protein, high blood pressure an increase in dissolved salts or lipids, etc.). Vessel length is the total length of the vessel measured as the distance away from the heart. As the total length of the vessel increases, the total resistance as a result of friction will increase. Vessel radius also affects the total resistance as a result of contact with the vessel wall. As the radius of the wall gets smaller, the proportion of the blood making contact with the wall will increase. The greater amount of contact with the wall will increase the total resistance against the blood flow. Blood vessels play a huge role in virtually every medical condition. Cancer, for example, cannot progress unless the tumor causes angiogenesis (formation of new blood vessels) to supply the malignant cells' metabolic demand. Atherosclerosis, the formation of lipid lumps (atheromas) in the blood vessel wall, is the most common cardiovascular disease, the main cause of death in the Western world. Blood vessel permeability is increased in inflammation. Damage, due to trauma or spontaneously, may lead to hemorrhage due to mechanical damage to the vessel endothelium. In contrast, occlusion of the blood vessel by atherosclerotic plaque, by an embolised blood clot or a foreign body leads to downstream ischemia (insufficient blood supply) and possibly necrosis. Vessel occlusion tends to be a positive feedback system; an occluded vessel creates eddies in the normally laminar flow or plug flow blood currents. These eddies create abnormal fluid velocity gradients which push blood elements such as cholesterol or chylomicron bodies to the endothelium. These deposit onto the arterial walls which are already partially occluded and build upon the blockage. The most common disease of the blood vessels is hypertension or high blood pressure. This is caused by an increase in the pressure of the blood flowing through the vessels. Hypertension can lead to more serious conditions such as heart failure and stroke. To prevent these diseases, the most common treatment option is medication as opposed to surgery. Aspirin helps prevent blood clots and can also help limit inflammation. ^ "Heart & Blood Vessels: Blood Flow". Cleveland Clinic. ^ "Blood Vessel Structure and Function - Boundless Anatomy and Physiology". courses.lumenlearning.com. ^ a b "Hematocrit test - Mayo Clinic". www.mayoclinic.org. ^ "Blood Vessels - Encyclopedia.com". www.encyclopedia.com. ^ "How the Heart Works". WebMD. ^ "Factors that Affect Blood Pressure" (PDF). Retrieved 21 Oct 2018. ^ "Blood Vessel Diseases - Mercy Health System". www.mercyhealth.org.